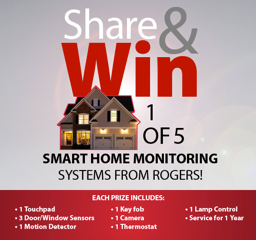 So back at the beginning of March I posted about Roger's and their contest they have going on where you can win one of five security home systems. Since this contest is ending soon (May 16th) I just wanted to send out a friendly reminder in case you didn't get a chance to enter. It only takes a couple of minutes and it's worth it. This Smart Home System is valued at $1500 and if you won you'd also be making your home a little bit safer. One (1) of five (5) Rogers Smart Home Monitoring systems consisting of: (one) 1 touchpad, three (3) door/window sensors, one (1) motion detector, one (1) key fob, one (1) security camera, one (1) thermostat, one (1) lamp dimmer module including professional installation and monitoring service for one (1) year – approximate total value of $1,518.83. Remember you can get more entries to increase your chances of winning by sharing this contest to your friends via email, facebook and twitter! Contest ends 5:00pm EST on May 16th, 2012. Disclosure: This post has been compensated. All opinions are my own.